I recently came across an old Wake County atlas my parents gave me when I turned 16 and was amazed at how much had changed in the past 25 years. Brier Creek was just a creek, Interstate 540 was just a proposed “outer loop” to our Beltline, and while there were some communities north of North Hills Mall, the development was certainly not as dense as it is today. Growing up in Raleigh, North Carolina, I never imagined this quiet region would one day transform into a thriving entrepreneurial hub. Back in 1980, Raleigh had a population of 150,255 and covered just 55 square miles. Local industry centered around tobacco and textiles. My family spent little time downtown apart from attending the annual performance of Ira David Wood’s A Christmas Carol. We rarely drove the 25 miles to Durham, except when we had tickets to see the Durham Bulls, the local minor league baseball team. Downtown Durham was not a place where you wanted to be when the sun set. During the years when I went to college and began my career in New York, the broader region commonly called Raleigh-Durham-Chapel Hill (also known as the Research Triangle), exploded with new life and new business. Today, Raleigh’s population tops 460,000 and its acreage spans more than 140 square miles. So much investment has poured into the Raleigh and Durham city centers that they are now both considered hip, attractive communities for downtown living. Our region has become a hotbed of commercial innovation with its accessible cost of living and appealing lifestyle. Businesses are finding this to be an ideal place for launching, relocating, or expanding operations. Forbes named Raleigh #2 overall among the best places in the country for business and careers. Amazon and Apple both eyed our area seriously for expansion, and although those companies ultimately chose to go elsewhere (though rumors persist we still may be in the running for Apple), Raleigh has landed a number of big companies and boasts deep homegrown talent. Open-source software powerhouse Red Hat, for example, is expected to merge with IBM this year in a $34 billion deal. Bronto Software was bootstrapped by two Durham locals a few years ago and is now a division of Oracle. Just up the street in Cary, the maker of Fortnite, Epic Games, completed a $1.25 billion equity raise last year. Meanwhile, we have “rocket ship” companies like Pendo, a software company growing like wildfire with plans to add 590 jobs in Raleigh this year. People are talking about it being a future unicorn—that mythically rare startup valued at $1 billion. Our area enjoys a wide pool of intellectual talent from three institutions of higher education and research: Duke University, the University of North Carolina at Chapel Hill, and North Carolina State University. Nearby Research Triangle Park (RTP) is home to over 275 tenants, with more than 100 biotechnology and life sciences companies, 71 service providers, 43 information technology companies, 29 advanced materials and green tech companies, 15 nonprofits, and other firms. It is no surprise that my firm, Balentine, chose this region in 2011 to open an office. 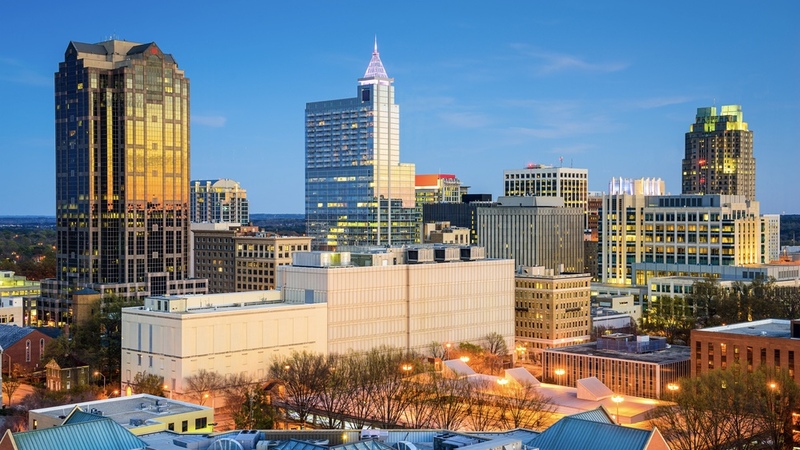 As a wealth management firm focused on advising business owners in transition, entrepreneurs, and executives, we found Raleigh the ideal city to plant our Balentine flag. Today we manage almost $1 billion from our office in Charter Square; this growth is directly attributable to the region’s business successes and our ability to hire talent from local universities and beyond. Today, Raleigh and the surrounding areas have so many new companies, so many restaurants, and so much culture. Each morning when I get on the office elevator, I see that same diversity I experienced during the years I worked in New York City, where it was fun to have people from all over the world working on the same team. I love the vibrancy of how my city has grown. Walk into a downtown restaurant now and you may only find three Raleigh natives; everybody else is from other places. Like any other place, we do have challenges. For example, the infrastructure is not as robust as in other communities. We don’t yet have a comprehensive mass transit system, which could be why Amazon ultimately decided not to come here. Officials have been working to find alternative, award-winning ways to ease daily commutes, exploring a rapid transit bus system and expanding an inter-county light rail project. The business community came together in its effort to secure the Amazon HQ opportunity; that shows me we’re serious about attracting business, so I’m hopeful we’ll continue to find more infrastructure solutions. Still, colleagues who visit from out of town remark on how collegial this area seems in contrast to many bigger cities. We don’t experience the massive gridlock of Atlanta or Los Angeles, or the intense competition or high cost of living of New York City or Boston. You can live close to where you work and play, with the beach two hours away, the mountains three hours away, and performing arts centers, professional sports, and college basketball in close range. You’ll find lots of local parks to get outside. It’s just a nice environment to live in, which can help keep you and your workforce more engaged. I recently joined the board of directors of the Council for Entrepreneurial Development (CED), a 35-year-old organization that touches not just investors and entrepreneurs but their entire ecosystems including attorneys, CPAs, and other resources. CED’s mission is to support the entrepreneurial community through networking, helping startups raise capital, and helping capital allocators get in front of people with promising ideas. While the organization hosts events throughout the year, it is taking over downtown Raleigh in late February as host of both a Tech and Life Science conference, where collectively you’ll find more than 1,600 entrepreneurs, investors, corporate leaders, and industry visionaries from across the nation.